The lifespan of a volcano can be measured in millennia, and so waiting a few days for it to erupt may not sound too stressful. But for the tens of thousands of Balinese people forced from their homes, the "imminent" danger that they have been living with for more than a week feels very real. Ketut Seri says she has already lost track of time since arriving at one of the emergency shelters. Sat surrounded by thin plastic bags stuffed with her children's clothes, she says she can't help but worry about what she's left behind. "I wish I had brought my cooking utensils," she tells me, a sign that she expects to be here for the long haul. "I'm tired, I'm sad because I cannot work," she explains, "I cannot find any solution." Her children chase a football around the concrete hall they have been living in alongside another 100 evacuees. But Ketut's husband is absent after venturing back to their empty village to check on the animals. He is not the only one taking that risk. The fate of the cattle and chickens many had to leave behind in the hills weighs heavily on people's minds, and so some are crossing back and forth into the danger area every day to check on their well-being. According to the volcanologists monitoring Mount Agung, this situation could continue for weeks, maybe even months. An eruption may not even happen, they simply don't know. At the government observation base, senior seismologist Devy Kamil remains patient - despite the long queue of journalists who have been knocking on his door all week, hoping for some news. "There are some examples where you have swarms of activity for as long as six years," he explains, "and it is not always ended by an eruption." When lava last flowed from Mount Agung in 1963, the measuring instruments they use today were not in place, and so it is impossible to know the signature behaviour of that shows an eruption is coming. 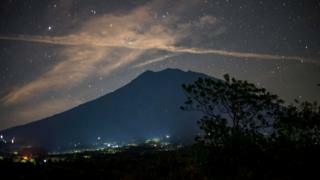 What's happening at Mount Agung? But while some here scrutinise every little piece of scientific data, others are waiting for spiritual signs. At the Goa Lawah Hindu temple, daily prayers continue at the site of a cave that many Balinese believe is connected to the volcano's energy. When I ask Iputi Juliad, one of the temple officials, what people are praying for, he says most just want good luck. He sees the wait for news from Mount Agung as part of a much longer process. "There is a circle of life, a circle of sacrifice" he explains. When I ask if the seismic activity is seen as a sign that the gods are angry, he is very careful in his reply. "It is not a punishment, not a punishment," Mr Juliad repeats, anxious to move on from a sensitive subject. Instead his focus is on the need to accept fate. "Maybe an eruption, maybe not, nobody knows." The uncertainty is having an impact on everyone on Bali, even if they haven't been evacuated. The village of Rendang sits just outside the exclusion zone, and normally the market place would be bustling with the traders selling fruit, flowers and rice. But according to stallholder Ketut Astiningsih, most people have stopped coming and her income has taken a massive hit. "No one is shopping. Before I could get 400,000 Rupiah ($30 USD) a day, now I can only earn 50,000 Rupiah ($3.7USD)" she explains. So far the economic consequences for Bali's tourism industry have not been so grave. At the hotels, the busloads of holidaymakers keep on coming, reassured it seems by the government's message that they will be kept well out of harm's way. Of course every tourist has heard or read about the volcano, and many have been contacted by worried relatives back home. 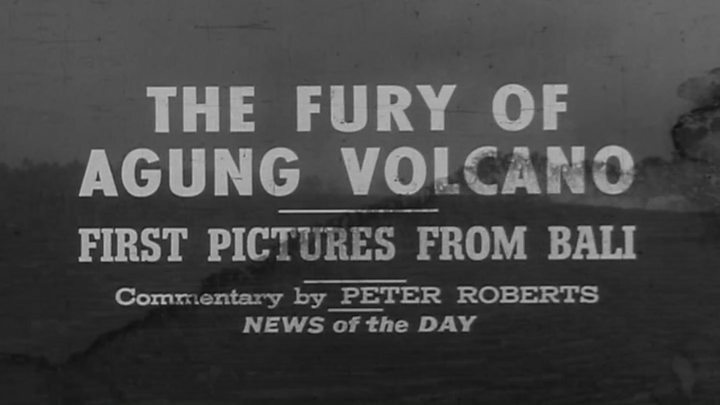 But for most the only concern is whether an eruption would mean they could be marooned here. As he sipped a beer on the beach at Sanur, Mathew Hunter from Cairns in Australia seemed pretty relaxed by that prospect. "I could definitely do with a few more weeks here," he chuckles, before adding that he is far more concerned about the fate of the tens of thousands of evacuees in emergency shelters. Like most people on Bali, he says he would like to see this waiting game with Mount Agung come to a swift but peaceful conclusion. "I just hope it has a few little belly rumbles and then life goes on."